Yoga with Melissa 87 is on the Warrior Poses. In this hatha yoga class we will connect with our inner warriors who bravely battle with the universal energy of self-ignorance, the ultimate source of our suffering. Drawing from the story of Virabhadra who rises up out of one of Shiva’s hairs thrown to the ground in a fit of anger, we will be practicing warrior I, II & III. Also thrown into the mix is “dying warrior” for good practice in letting go. By practicing the warrior poses we can learn to cultivate intelligent action over reaction. The true fight of the warrior is against our reactive minds. 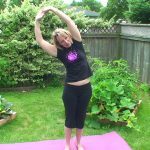 This hatha yoga class begins with the story of Virabhadra and then we come to standing to do a short vinyasa sequence to release your shoulders. From there we come back to the ground for two more gentle flow sequences to release your shoulders, hips and spine and to prepare your legs for the warrior poses. 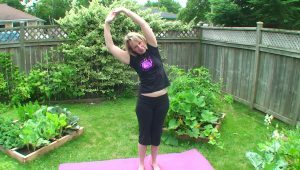 When we come to kneeling we practice modified versions of the warrior poses in preparation for the standing versions. In standing we practice warrior one, warrior two, warrior three and then dying warrior. There is also a reverse plank towards the end of the class.